POD will be shipped in 19 Days. 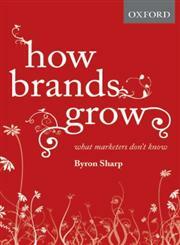 The Title "How Brands Grow What Marketers Don't Know" is written by Byron Sharp. This book was published in the year 2010. The ISBN number 0195573560|9780195573565 is assigned to the Hardback version of this title. This book has total of pp. 160 (Pages). The publisher of this title is Oxford University Press. We have about 91831 other great books from this publisher.